Ireland are marching on as the only team with a 100% record after three rounds of the RBS Six Nations, while Italy have a rare away win to celebrate. Which players were on song and who was off key this weekend? It was the RBS Six Nations game of the weekend, the Grand Slam eliminator, and while a clinical team effort from Ireland took them to a 19-10 victory over England, it was a moment of magic by Robbie Henshaw that proved decisive. Ireland were attacking at 12-3 up after 52 minutes and, knowing he had a penalty advantage, Conor Murray dinked a little kick over the ruck on the right. Henshaw dashed after it, leapt brilliantly to beat Alex Goode to the ball in the air and grounded it under great pressure from the England full-back. It was the 21-year-old Irish centre’s first Test try on his sixth start and with Johnny Sexton’s conversion it put Ireland effectively out of sight at 19-3 ahead. The men in green went on to secure their tenth consecutive International win, which equals their best run of all time. Italy’s Six Nations record shows they are, shall we say, not very good at winning away. 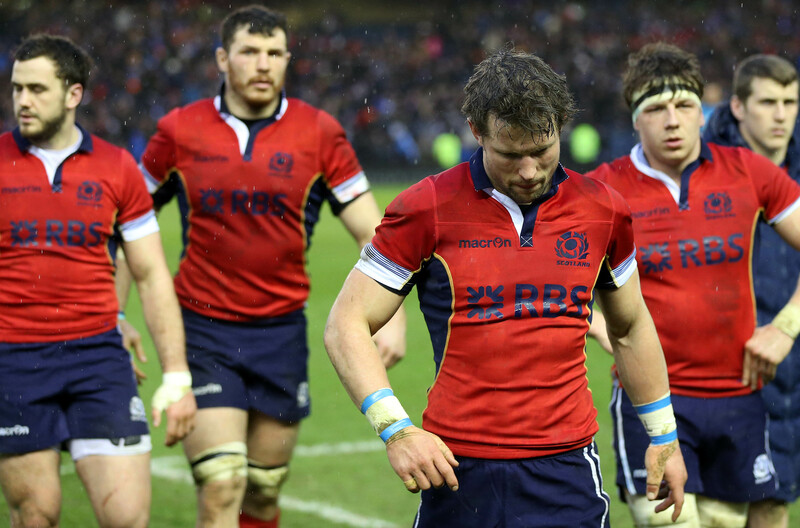 Before Saturday’s clash with Scotland they had one solitary victory to their name from 39 away matches (at Murrayfield in 2007), plus a draw v Wales in 2006. 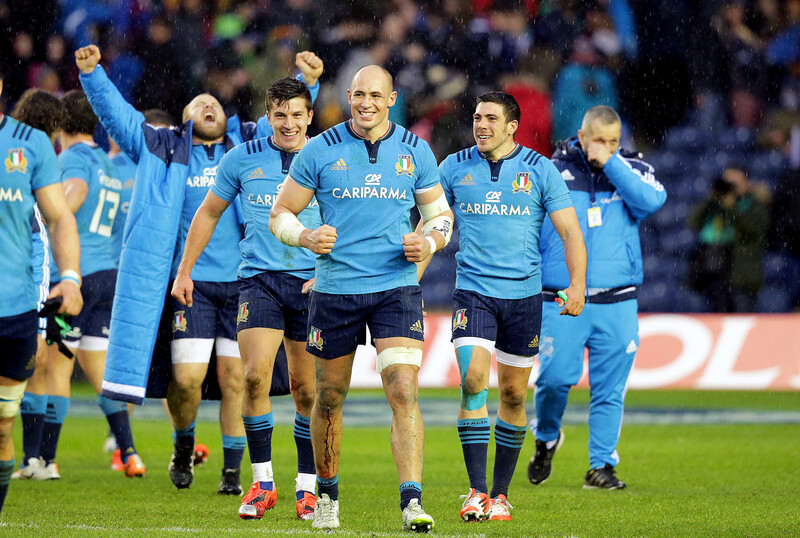 They don’t have the strength in depth or the quality of their rivals, but what they do have is a fantastic, world class player in the shape of their captain Sergio Parisse and he led them to a battling 22-19 win in Scotland this weekend. Luke McLean was named Man of the Match and did play an influential role, while Giovanbattista Venditti had the presence of mind to follow up a Kelly Haimona penalty and score a try when it rebounded off the posts. However, it was the Italy pack which won the game at the death, earning a last-minute penalty try with a series of driving mauls and at the very heart of that effort was Parisse. The statistics tell us he carried 11 times in the match – only McLean managed more among his team-mates – made 68 metres, which was Italy’s best, and stole a lineout. But it is his presence, his heart and his leadership which contributes just as much as his skills. Wales are celebrating after winning four matches in a row against France for the first time since 1952-7. They triumphed 20-13 in Paris on Saturday with a try from Dan Biggar and 15 points from the boot of Leigh Halfpenny, while one of most memorable pieces of skill in the match came from flanker Dan Lydiate. Known for his defensive work above all, he did not disappoint on that score as he made 12 tackles in the match, bettered only by Taulupe Faletau with 15. But Lydiate is not often singled out for his off-loading skill, so his deft contribution to Lydiate’s try deserves to be noted. He took a short pass from Rhys Webb and popped it straight back to Biggar on the 22 as fly-half charged through on the diagonal and headed for the corner. A potentially try-saving tackle by Jamie Roberts in the last two minutes was also critical, but head coach Warren Gatland reserved much of his praise for his “sensational” pack. 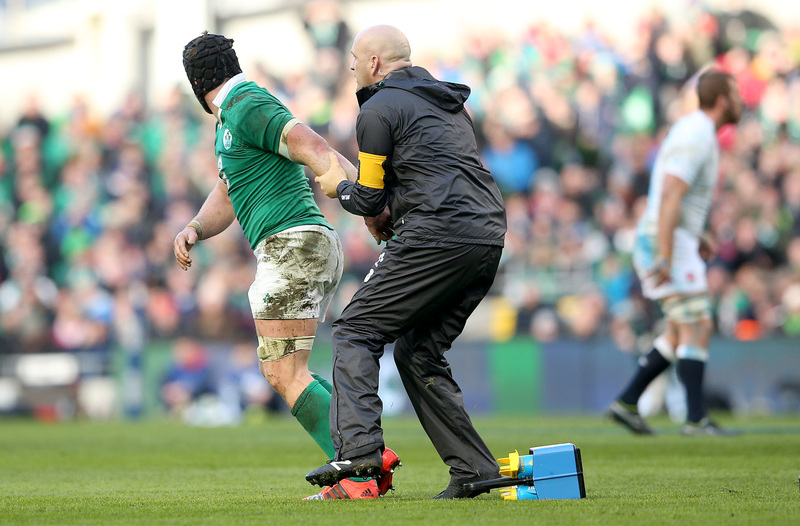 Ireland doctor Eanna Falvey did a great job of overruling a misguided player during Sunday’s match against England and thereby protecting him from further injury. Sean O’Brien went down midway through the first half and looked like he had taken a bang to the head. The openside was keen to play on, but Falvey literally grabbed him by the arm to stop him rejoining the fray. O’Brien is now being treated for concussion and will undergo a series of tests before he can play again. The Six Nations takes up most of rugby fans’ attention at this time of year but there are still important Aviva Premiership matches going on in England and a few players deserve a special mention for their positive contributions. Laurence Pearce ended Leicester’s 300-plus minute try-scoring drought when he crossed the line against Sale Sharks after 12 minutes and put the Tigers on the way to a 28-8 win. Alex Lewington became the tenth Premiership player to score a hat-trick this season as he helped London Irish beat London Welsh 50-12. You have to go back to 1998-9 to find more hat-tricks in a season in England’s top flight (thanks to Stuart Farmer for the stats). Will Chudley’s second-half try gave Exeter Chiefs their first Premiership win over Bath. They won 16-6 at Sandy Park and, along with Saracens and Wasps, leap-frogged Bath to move up to the top four in the Aviva Premiership table. There are players to herald from the Guinness Pro12 too, not least the Cardiff Blues team which bounced back from last weekend’s shameful 40-24 loss to Benetton Treviso to beat Edinburgh 21-15 this weekend. With coach Mark Hammett leaving for personal reasons and no Pro12 win to their name since 1 January, it was a big victory for the Blues and scrum-half Lloyd Williams was at the forefront of it. A try from Craig Gilroy was instrumental in Ulster recovering from 13-6 down at half-time to beat the Scarlets 25-20. The win puts them level on points with Glasgow Warriors and just one point behind Munster at the top of the table. Munster went top thanks to a 22-10 win over the Warriors, with Man of the Match Keith Earls among their four try-scorers. Poor Peter Horne. The talented 25-year-old was doing a decent job for Scotland in his first start for them at No 10, especially considering he is more used to the centre’s role and is behind the suspended Finn Russell and the injured Duncan Weir in the stand-off pecking order at Glasgow Warriors. However, all his good work was undone at a crucial moment near the end of the game, as his basic skills let him down. Inside the last five minutes, Scotland were just 19-15 ahead and their pack held out at a scrum on their own line and earned a penalty. From there, they should have cleared their lines and closed out the match. However, Horne missed touch, Italy counter-attacked and set up camp on the line in the right-hand corner. Their skill with the driving maul eventually told and referee George Clancy awarded a penalty try for Scotland collapsing a maul on their own line, Tommaso Allen converted and Italy stole the win. 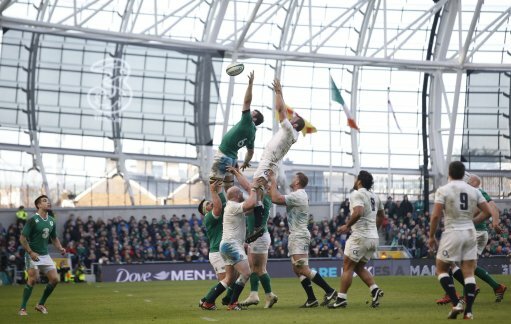 England lost three lineouts during their 19-9 loss at the Aviva Stadium and Dylan Hartley was the guilty party at one particularly crucial one. England were just 6-3 down in the 23rd minute and in an attacking position on the right, but Hartley over-threw a lineout ball which was intended for James Haskell at the back and Ireland tidied up and exited the danger zone. A try at that stage would have changed the complexion of the game, but Hartley’s error gave England no chance of turning pressure into points that time. Hartley was substituted after 53 minutes, but he was certainly not the only guilty party in England’s defeat. Haskell conceded three penalties out of the 13 his team gave away and collectively England missed 23 tackles. The six players who started in the front rows for Scotland and Italy incurred the wrath of a few thousand spectators at Murrayfield, even more armchair viewers, and referee Clancy with their messing about at the first few scrums of the game. What should have been two scrums used up a total of three minutes and 13 seconds. Thankfully things got better from there, but it was a great shame the game was held up for so long because six players would not do as the referee asked.